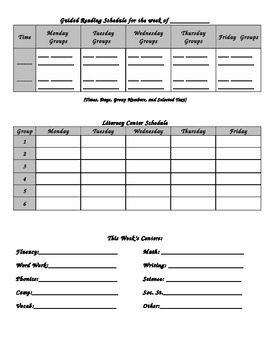 This editable planner allows teachers to plan an entire week's activities for guided reading groups and literacy centers in one place. It is formatted for teachers to fill in a time to meet, activities to do, and groups to meet with each day of the week. There is also space to include the literacy centers for the week and which groups will go to which groups. This is a Microsoft Word document, so you can edit as needed.